Give your backyard friends a gift they'll really enjoy. 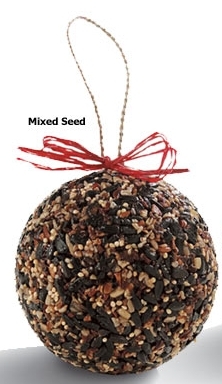 Extra-large wild bird seed ornaments are solid, compact balls of mixed birdseed and pecans. They can be hung on outdoor trees, porch hooks, or shrubs as a treat for clinging birds. Features red raffia bow and jute hanging loop. Each ball measures approximately 4" dia. This is a perfect gift to have on hand to pass out to teachers, hostesses, unexpected guests and other friends and family. 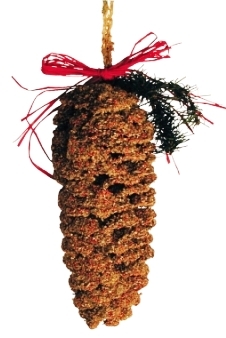 Giant Pinecones coated with sunflower seed without the shell and tied with twine so you can hang them over a branch. A fun way to decorate an outdoor tree in your own yard, these pinecones makes charming, nature-inspired gifts for bird lovers. Available for a limited time only, our Snowman Seed Cylinder is a seasonal mix of safflower, sunflower chips, peanuts, cherries, blueberries and papaya to attract a variety of birds. 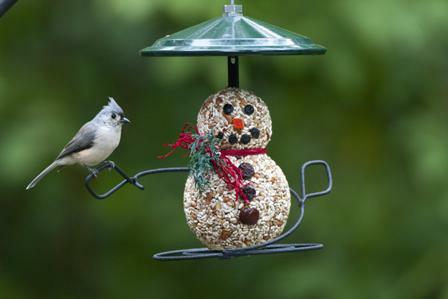 Simply slide the Snowman Seed Cylinder onto our WBU Seed Cylinder Feeders or WBU Dinner Bell™ feeder and enjoy the feathered holiday visitors. This is an adorable and unforgettable treat birds really love! The WBU Supreme Fare Seed Wreath does double duty during the winter season. 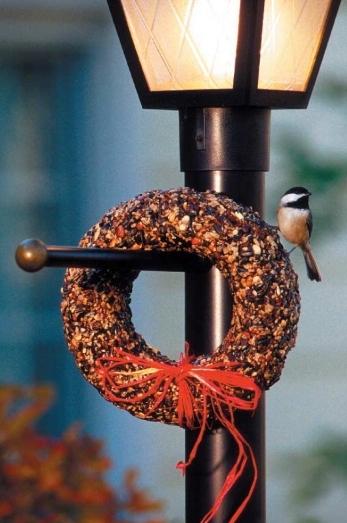 Not only is it a dining delight for birds, but it also adds festive cheer to any yard. This wreath is full of seasonally-appropriate ingredients including sunflower seeds, peanuts and pecans. It makes the perfect gift for friends that love nature but might not need another feeder. The wreath is 100% edible. Birds will eat this treat until it disappears completely. Each wreath comes in a clear wrapped gift box and includes a red hanging ribbon and seed net.